A shadow minister has called for an investigation into whether George Osborne broke ministerial rules by accepting the editorship of the Evening Standard. Labour MP Andrew Gwynne said former ministers must refer any new jobs to a committee for up to two years. The Cabinet Office said it would reply to the letter in due course. A petition calling for Mr Osborne to "pick a job" has also reached 100,000 signatures. Mr Gwynne wrote to John Manzoni, the permanent secretary to the Cabinet Office, urging him to examine whether there was a breach of the Ministerial Code of Conduct. In his letter, he said former ministers must refer any new jobs to the Advisory Committee on Business Appointments (Acoba) to "counter suspicion" and ensure ministers are not "influenced" by private firms while in government. Mr Osborne left the frontbenches last July when he was sacked as chancellor. Mr Gwynne, Labour's national elections and campaign coordinator, added: "Disregarding these rules deeply undermines public trust in the democratic processes and does a disservice to those Members that ensure they follow the rules laid out on these matters." More than 100,000 people have now signed a petition created by a Tatton constituent which calls for the former chancellor to choose between editing the Evening Standard and his role as MP. "It's not appropriate for someone to be a member of the government and also control a huge amount of the media," said Diana Simkins, who created the petition. On BBC Radio 4's Today programme, it was claimed Tatton MP Mr Osborne showed interest in the editorship of the London newspaper after friends asked him for advice on applying for the job. According to former Downing Street advisor Rohan Silva: "He said that a bunch of people had been calling him up asking him for advice on whether they should apply for the editorship. "And after a few of these calls he thought, 'hang on, this is something I really want to do', so he reached out to the Standard." What do Tatton Conservatives think? Mr Osborne's editorship is one of several roles he has taken up after being forced out of frontbench politics. On top of being an MP, he gets paid £650,000 a year to advise Blackrock Investment Institute, as well as being the unpaid chairman of the Northern Powerhouse Partnership. Read media editor Amol Rajan's blog on George Osborne's appointment. Reports suggest that Mr Osborne - who unsuccessfully applied to the Times graduate scheme in 1993 - will get paid £200,000 a year for being editor of the Standard. 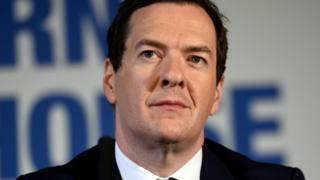 Mr Osborne faced criticism after being named editor, with some arguing he should quit as an MP. Image caption Former BBC journalist and independent MP for Tatton Martin Bell said Mr Osborne was "the most ambitious man I've ever met"
Former BBC journalist and former independent MP for Tatton Martin Bell said: "I think multi-tasking of this scale has never been heard of before and there's a strong case of putting it to the people. "He's the most ambitious man I've ever met, but for the life of me I don't see how it's possible to combine all of these demanding jobs."